Published on March 16, 2015 in General T&T, International, USA and Venezuela. 2 Comments Tags: Hugo Chávez, Nicolás Maduro, Politics. The citizens and Government of Trinidad and Tobago are being urged to reject the recently announced United States sanctions against Venezuelan government officials accused of violating protestors’ rights during demonstrations earlier this year. 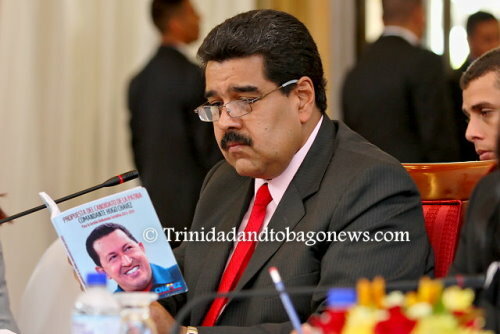 The call came yesterday from several groups sympathetic to the administration of Venezuela’s President, Nicolas Maduro, including the Trinidad and Tobago Bolivarian Solidarity Movement (TTBSM), the Movement for Social Justice (MSJ) and the National Workers Union (NWU). Representatives of each read out statements during a rally at the Queen’s Park Savannah, Port-of-Spain, yesterday morning in the vicinity of the US Embassy on Marli Street. A statement issued on Saturday by the Union of South American Nations (UNASUR) was also read out at the event. The political party also said it had “no doubt that the US is pursuing its old imperial agenda of seeking to control strategic resources globally, and in particular, to control oil and energy resources.” MSJ then claimed the “evidence is clear” that Venezuela is being deliberately starved of vital supplies for everyday living, from toilet paper to basic food items, “by local merchants in co-ordination with the US government to destabilise the country in order to promote regime change.” As such, it yesterday called for an immediate removal of all US-imposed sanctions against Venezuela. UNASUR then reiterated its call to the US government to evaluate and put in practice alternatives for dialogue with the government of Venezuela. The U.S. have to stop behaving with a high level of belligerency in regards to Venezuela. Venezuela is hurting economically and does not need more sanctions but needs help. The internal matters within a democratically elected government must be treated with great respect. The US foreign policy for Latin America has not been the smartest just ask the Columbians, Nicaraguans and other governments. Sometimes they prop up dictators at the expense of ordinary citizens. Venezuelan leadership is suspicious of US motives towards their nation. That is not unfounded due to past experience. The American administration need not to turn Venezuela into another Putin loving nation. They must not proceed arrogantly but rather with wisdom knowing that terrorist can enter the US from Latin America…..